We caught up with Antonia, a real Rosetta Stone user who learned Russian. Discover her incredible language journey and find out what makes it the perfect Valentine’s Day story. What was your learning schedule like when you practiced Russian? How often did you practice in a week? How long was each session? Early on in the process, my schedule was intense. I put in an hour or two every day, and more on the weekends. Having Andrei in my life was definitely an incentive! He lived in Milwaukee for the first 1.5 years of us dating, while I was in Chicago, so we only saw each other on the weekends. I remember being excited to be able to show him the new phrases I learned, and I found myself challenging myself more and more because of it. After you and Andrei met, did you introduce him to Rosetta Stone? What did he think? Did he start learning a second language, too? Andrei had never heard of Rosetta Stone until we met, but he was super impressed when he realized that all of the Russian I had learned was through that program. He started using it to learn Spanish! How did Andrei help you with your Russian lessons? What were some pointers he provided? Andrei mostly helps me with grammar. The tough thing about Russian is that every word changes depending on how it’s being used. So the Russian word for car, “машина,” changes slightly when you say “I am driving the car.” Instead of “Я вeду (I drive) машина,” it’s “Я вeду машинy.” This was a new grammatical rule for me to learn as a native English speaker, so it’s pretty common for me to make mistakes. There are also sounds that we just don’t make in the English language. There’s a letter “ц” that is essentially a ts sound, that’s pretty difficult for non-Russian speakers to make. The funny thing is that it’s in Andrei’s last name, so my whole family struggles with pronouncing his name! What was the funniest Russian faux pas you experienced? Well, it actually wasn’t a faux pas that I made, but one that my dad made. My dad wanted to say a Russian phrase during his toast at our wedding and so we taught him how to say “To family!”. The phrase is “За семью!” which sounds like za sem-yoo. My dad wrote it down and made a very sweet, heartfelt toast at our wedding reception and then he said, “Now some of you will know what this means, ‘Засуну! (Za-soon-u!)’”. It was just a slight slip, a tiny mispronunciation, but he managed to say an entirely different phrase in Russian which essentially meant “Put it in!”. Needless to say, there were quite a few looks passed around the room by people who understood Russian. My poor father would have been mortified had he known what he announced to all our family and friends, so we didn’t tell him until a few months had passed. After you first met your husband, what motivated you to continue your learning? I desperately wanted to get to know Andrei’s father, Boris, better. Boris didn’t speak English (although he understood some of it), and he would come to visit us for 4-6 weeks at a time each year. I would practice day and night in the weeks before his visit so that I could really converse in Russian. I never got to the point where I felt comfortable discussing really difficult ideas/concepts (life’s big questions), but he and I could spend days together happily. Boris passed away almost a year ago exactly and I still regret not practicing more frequently and becoming really fluent before he died. He was a fascinating and wonderful man, and I wish I could have gotten to know him even better. Now, my motivation to become fluent stems from my daughter. I want so much for her to learn Russian naturally and I know it’s important that she hears Russian spoken in the home – not just from Andrei, but conversational Russian. How does learning a new language enrich your everyday life? I think it’s similar to how travel enriches your life. It exposes you to a wider world, where there are different ways to communicate and experience life. I think there’s a certain amount of discomfort that comes with both learning a new language and traveling to a new place: you are out of your element and forced to adapt. It’s a really wonderful opportunity to grow. In my personal experience, learning a new language completely transformed my life. I met my future husband, gained an entire new family on the other side of the world, and had a daughter who will be a citizen of two countries. We have a unique, cross-cultural family and I wouldn’t have it any other way. Have you ever traveled to Russia? If so, what was it like using your language skills in an immersion experience? How did people react? Yes! I’ve been to Russia twice now. The first time I traveled to Russia was shortly before I started graduate school. I had saved up for a big trip and wanted to go to another country. Andrei’s dad (who I had already met at the time), offered to have me stay at his apartment in Moscow and he could show me around the city. I jumped at the offer to explore a new country AND have an opportunity to use Russian every day. I was there for two weeks and Boris took me all around Moscow and the Russian countryside. I absolutely loved it. I was nervous to speak Russian to strangers, but as soon as I started speaking everyone was so happy that I was taking the time to learn that they were really warm and helpful. And it was so wonderful meeting Andrei’s sister and her husband and all of his extended family. The second time I went to Russia I traveled with Andrei, and it was a honeymoon trip. That trip was wonderful for all new reasons. I was able to see Andrei in the place where he grew up, in the midst of his family, and it was really beautiful. Why do you think Russian is an important language to learn today? Russia has such a rich history and it’s a wonderful place to visit. Honestly, though, I’m not sure I would have even thought to start learning Russian had it not been for reading Dostoevsky. I just marveled at his writing and thought how wonderful it would be to read his work in its native language. I started learning Russian on a whim, but it absolutely changed my life and now I can’t imagine my life without it. I think learning any language is a way of embracing the unknown. Russian just happened to be the unknown that I embraced. What are some tips you have for English speakers learning Russian? Use Rosetta Stone! 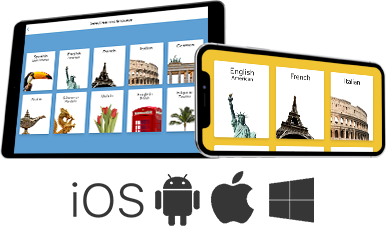 I know that’s a shameless plug, but there are lots of language-learning tools out there that I’ve tried and Rosetta Stone tops them all. The main reason is that there are sounds in Russian that are really difficult to make, and Rosetta Stone requires that you pronounce words correctly before passing on to the next level (by using a headset with a microphone). This was invaluable for me. I remember once saying the phrase “I’m cold” to Andrei and he looked at me and said, “You said that like a Russian!” It was the nicest compliment he could have given me and it’s what all people learning a new language really strive for. Do you speak any other languages besides Russian and English? How are you teaching your daughter Russian now? Does she regularly speak to her relatives in Russian? We speak Russian whenever possible, and Andrei really tries to only use Russian with Evie. Occasionally I’ll even sit her on my lap while I do Rosetta Stone, and she thinks of it like a game. Want to fall in love with Russian, too? Start now.